Sometimes Platform is really late off the mark, but luckily a friend in Liverpool gave us a nudge. Thanks Lena. WARNING – this blog post contains spoilers. Channel 4’s recent 4-part political thriller ‘Secret State’ has an oil and finance storyline, elements of which uncannily mirror some of Platform’s current and recent campaigns. The plot combines an unrepenting global oil & gas company ‘Petrofex’, an explosion at a Petrofex chems plant caused by drone fuel that devastates a Teesside community, and the recently bailed out ‘Royal Caledonian Bank’, the biggest investor in the oil company. There’s a true story behind the fiction: In 2007 Platform exposed the Royal Bank of Scotland as the UK bank most heavily involved in financing fossil fuels. There’s a ‘good’ prime minister played by Gabriel Byrne who stands up to hawkish and corporate-stooge colleagues who want to blame the Iranians for nearly everything and keep in bed with big oil. OK, the CEO of Petrofex looks and behaves more like an English Michael O’Leary than an Oxbridge ‘company man’, and the corrupt banker who heads Royal Caledonian Bank bears a striking resemblance to ex-BP chief John Browne, but all these resonances help build a searing critique of the forces at play in a so-called democracy. Women play a key role – there’s the incisive investigative journalist who never lets up on (a definite frisson, but no, sadly the PM and she never get together), a young smart spy at GCHQ who puts herself at serious risk doing the right thing. An obligatory short-haired, blond, ambitious Foreign Minister hungry for power. But what does the ‘good’ prime minister do? He publicly denounces the oil company’s behaviour regardless of Petrofex’s threat to move capital and production out of Britain to Poland. If only the Labour government had been that sympathetic when we launched a judicial review over RBS’ role in driving climate change and conflict through its lending. Finally, a last uncanny connection: the acclaimed actor Douglas Hodge plays an ex-spy who uncovers a tissue of lies at the centre of the plot, and is assassinated. Hodge played the lead in our popular audio walk and ‘opera for one’ about climate change & The City, And While London Burns. The mini-series ends with the PM’s head rolling, but not without a vivid portrayal of how power can operate behind the scenes. Know of any more mainstream films on oil, climate change, environmental/human rights devastation, and corruption? Let us know. It’s useful to track how the pop and entertainment industries are framing these issues for mass audiences, invariably relying on reinforcing dodgy national stereotypes. In a recent episode of Channel 4’s Student sitcom Fresh Meat, one of the main characters recreates Liberate Tate’s iconic oil spill from under a dress during a BP recruitment event. Here’s the original. 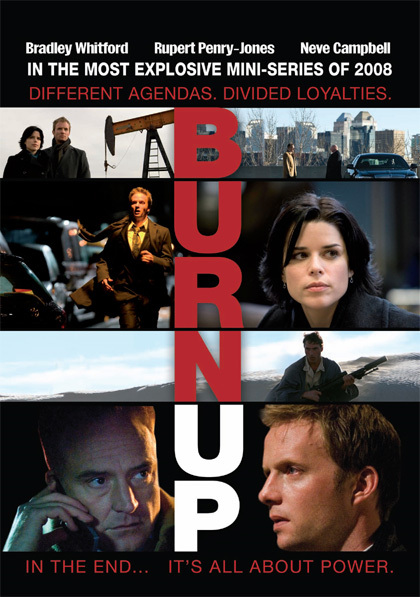 Or try ‘Burn Up‘, (2008) a BBC two-part drama on climate change, which tracks an oil company executive’s journey to whistleblower, and the power of an individual woman activist’s protest about impacts on indigenous communities in arctic Canada. Hollywood-fringe film ‘Syriana‘ (2005) features a washed-up and podgy CIA agent George Clooney embroiled in an action thriller on global oil politics, set in a fictionalised Arab oil state. Or the Hollywood freak ice-age blockbuster ‘The Day after Tomorrow‘ (2004) which ends with Mexico aiding fleeing US climate refugees, and the Rumsfeld-like Vice President having an epiphany…(ahem). Even James Bond does a stint in the oil fields of Azerbaijan in ‘The World is Not Enough‘ (1999) – before zooming through the about-to-be-activated new Baku-Tbilisi-Ceyhan pipeline. In The Oil Road, Platform followed the same pipeline – above ground. Worth watching this one for how Hollywood portrays oilfields in an under-regulated state that is propped up by western and Chinese interests.